HERMIT-CRABS.COM. Your hermit crab care headquarters! A good time was had by all, even the crabs! 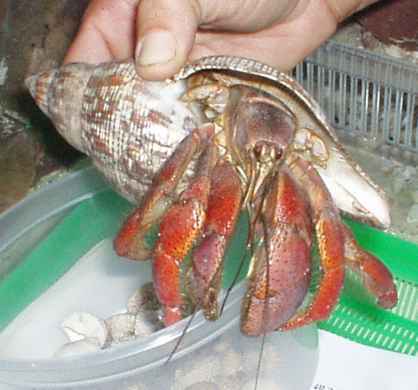 From 2000 until 2004, the HCA: Hermit Crab Association had some really cool conventions! As the co-founded of the HCA, I personally took it upon myself to get these things going and make them fun! Everyone who attended one agreed, it was an unforgettable event. After I had my first child in 2004, I was unable to devote the time necessary to coordinate a big bash of a convention, so I turned it over to other members of the HCA. If you want to see what is has gone on since then, and what is currently in the works regarding HCA conventions, please visit the HCA: Hermit Crab Association's Convention Happenings Forum. You have to register to view and post on the site. Who knows? Maybe you have the drive and funds necessary to get that great Convention engine chugging along again! Here is a wonderful chronology of those awesome conventions held way-back-when! 2004 in Key West, Florida! 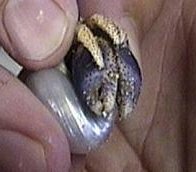 The Hermit Crab Association held its 2004 convention in sunny Key West, Florida! The highlights of the convention were definitely the kayak trip, the snorkeling trip and the crab awareness event at Reef Relief. The kayaking trip was amazing and by far the very BEST part of the whole trip. Chad from Blue Planet Kayak scouted out a special trip "just for us" for a very reasonable price! We donned mosquito gear, got in the kayaks and paddled to a place we call the "Crabby Island. " It was AWESOME! We found at least 6 crabs hiding under one sea-grape tree and about 10 others out for an evening stroll. Interestingly, most of the crabs we saw were either on their way to or from the water, so they do regularly visit the beach. The largest one we found was slightly larger than a golfball and very mad at being "discovered." There were also a ton of marine hermies. Chad explained to us that sometimes the land hermies will wade into the water and steal shells from the marine hermies! Chad was absolutely wonderful and it was his help as much as anything that truly made it a memorable trip. A few days afterwards, we went back to where we'd shoved off for the trip and left a lot of shells for the natives. The snorkeling trip was really neat. We saw parrotfish, barracudas, a shark, snappers, and all kinds of other fish. Plus the beautiful sea fans in their natural state and a lot of neat coral. The brain coral in particular was really cool. At the crab awareness event, we had an unexpected visit from three rangers from Fort Taylor Park. They had found the giant hermie (picture at right) sitting in the middle of an intersection on Key West and they needed to learn how to care for him in captivity (they didn't want to release him in case he does it again and gets run over!) The crowd of about a dozen was very engaged and asked a lot of questions. About 6 other people came in, grabbed care sheets, and left, so they got "the message" without staying. One of the rangers invited us over to Fort Taylor later that day or the next day to see the giant hermie and to look for hermies under the sea grape trees. We met up with her on Wednesday afternoon and met their giant, who was a beautiful reddish color. Then we did some more shopping and went back shortly after the sun had set and found more wild hermies under the sea grape trees. It was great! In 2002, the Hermit Crab Association got itself together down in Sunny Sarasota, Florida! We got to meet the folks at Florida Marine Research ("FMR") and tour their facilities. Also we drove down to Key Largo and met up with some beautiful wild hermit crabs in the mangrove swamps. First things first! We all got together at the Best Western in Sarasota and got ready for our trip to FMR the next day. We did a test-drive there to make sure we knew the route and got lost. But all was well and we managed to make it back to the hotel and we were on for our tour! The next day Kathy and FMR opened us with welcome arms and gave us a full tour of most of the facility. We saw what the hermit crabs were like when they came into FMR, and where they were offered new shells, and also the huge holding pens where hermies stay until it was time for them to be shipped to a pet store. The 2001 Crab Convention was a rousing success! Crabbers from Michigan, Pennsylvania and New Jersey gathered to talk about their crabs and participate in all kinds of fun events! On Saturday evening, July 28th, Cerissa and I went for a walk up the street to Sunsations and came back with six jumbo hermit crabs! 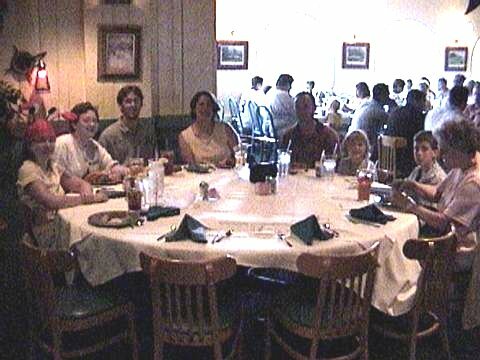 Then my husband and I met up with Cerissa and Eric of Charlottesville and Arlington, Virginia, and Laurie and Brad (and their family) of Ann Arbor, Michigan. We had a wonderful time getting acquainted! The second day of the Convention was wonderful, despite the rain that pounded down all day. We started out our day with a delicious breakfast and read up on the pros and cons of incorporating the Hermit Crab Association. Then we headed up the road to Sea Shell City. Pandelirium! Excited crabbers exploded everywhere in the store! SSC was kind enough to let us go behind the crab sales booth so we could pick out our crabs ourselves. We got to see a humongous crab (whom Cerissa promptly christened "Zeus") and we also saw a fascinating genetic mutation – a purple claw crab with two purple claws! After we got out of SSC, we went for a brief walk on the Boardwalk and saw hermit crabs in wire cages, in the open. We were very upset (the rain was cold, the outdoor temperature about 60 degrees). We ended up rescuing "Bubba," a jumbo PP from a freezing cold pet store. Bubba came home to Christa's hotel room and lived in the bathtub until he accompanied Laurie and her family down to North Carolina. Unfortunately Bubba did not survive and was given a heartfelt burial in the high-tide zone of a beach, only two days after his rescue. Monday morning dawned with the rain tapering off. The Conventioneers started the day by making great iron-on T-shirt to commemorate the event. Christa provided the iron-ons and iron and Laurie the T-shirts. A good time was had by all! While we were making the T-shirts, the rain stopped, so Christa and Laurie took a walk along the Ocean City boardwalk to look for places selling Ecuadorian crabs. We did not find any of them and were very upset by their cage conditions. Flies, bodies and limb pieces everywhere. One place smelled so badly of dead crabs we practically had to hold our breath as we walked past. We both had made separate efforts individually to talk with the Boardwalk store owners about the proper method of crab care, but none of them or their employees were interested. A few of them did accept Christa's "crab care" business cards, though. The Sunsations Crab Awareness Event! Around 3PM on Monday, Christa, Lisa and Laurie visited a Sunsations Shop at 5th Street & the Boardwalk and set up shop for the very first Hermit Crab Health Awareness event ever held in Ocean City Maryland! Sunsations provided us with critter carriers, crabs of all sizes, FMR food and crab-care booklets. We brought along our own tap water dechlorinizer, Stress Coat�, and care sheets. Christa designed and Lisa produced a large banner we hung on the front of our table. In transit Tuesday! Tuesday was a bright and sunny day, and Lisa and Christa hopped into Christa's crab-stuff-loaded car for the trek to New Jersey. Christa and Lisa rolled into Rehoboth Beach about an hour after starting out, and our first destination was the Sea Shell Shop! We pulled into the Sea Shell Shop around 3PM and learned that the manager had been waiting for us to arrive all day and had finally left just five minutes before our arrival. We were very disappointed, as you can imagine. Crab lovers actively seek each other out and we missed talking with her! We spent a lot of time in the Sea Shell Shop and got to hold most of their jumbo crabbies. Also we both bought some beautiful shells for our crabs and some other crab-related items. We had a wonderful visit! Then we rolled down into the Rehoboth Beach area to look for stores selling crabs. Since we were on a tight time schedule (had to catch the ferry in an hour) we did not have much time to look, and quickly grabbed a bite to eat before packing up and heading out to Lewes. We arrived at the Cape May/Lewes Ferry about an hour before our scheduled departure. We arrived in New Jersey, and Lisa went to stay with her parents at their bed and breakfast. Christa dragged all her crabbing stuff into the room and let the crabs loose in the bathroom, SOP (Standard Operating Procedure) at this point! Linda and Bob DeFalco came by and we had a wonderful chat. Afterwards, Christa went out on the Boardwalk to see how things looked, and when she came back there was a message to call our contact (whose name escapes me at the moment). We ended up trekking out to the Nature Center where we're going to making our presentation. Lisa and Christa set up our props (minus crabs, of course). The day ended with yet another walk of the Boardwalk. Christa was disappointed at the lack of basic crab needs. One person refused to give them water until she threatened to report the employee to the manager. Christa purchased a half-dead crab and managed to make him comfortable before he passed away that evening.